Which cameras work for digiscoping? A reader writes: I want to get into digiscoping. My problem is that I don't know which camera to get to go with a particular scope and digital camera adapter. Furthermore, new cameras come on the market all the time, and perfectly nice ones are discontinued. Makes it hard to make a recommendation that will not go out of date. There are many cameras that will work with each scope, but the manufacturers do not publish lists of which ones do (probably because cameras change so fast). Here are some combinations that work. These are certainly not the only cameras that will work with each scope/adapter combination. But they are cameras we know will work with some of our favorite scopes. Note that for all digiscoping cameras, a camera with not more than 5x optical zoom is preferred, as it minimizes vignetting. Preferred is 3x to 4x. The Swarovski ATX HD scopes are revered for their clarity. 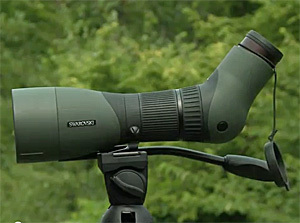 Swarovski offers several digiscoping solutions that work well with point-and-shoot cameras. Watch this space. It's the page Diane is working right now. The cameras listed below will work with the Digital Camera Adapter, which requires threads in the lens housing. For each cameras you need an "accessory adapter" (sold by the camera manufacturer); listed below each camera. The most economical good quality scope we've found in our extensive tests, the Alpen 788 offers an optional digital camera adapter. See right. The Alpen Digital Camera Adapter 706 holds your point-and-shoot digital camera in the correct position so that you can take photos through your Alpen 788 scope. The adapter is a frame made of two major pieces, which support the camera and the scope. Works only with the 788 model scope. The Alpen digital camera adapter 706 works with almost any normal-looking compact digital camera. That is, a camera that is essentially shaped like a deck of cards, with the widest dimension being left-to-right. If the camera has an optical zoom, it should be 4x or lower power. The camera does not have to have threaded lens housing, because the camera is held in place with the adapter by its external rod. The Vortex Razor HD 20-60x85 Angled Spotting Scope amazed us when we compared all the top scopes for our review in Bird Watcher's Digest. 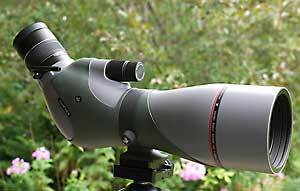 This is a beautifully designed, bright, sharp, rugged scope, with angled eyepiece design. We recommend it highly. It's the only scope with truly high-end optical quality at such a moderate price, which includes the 20-60 power zoom eyepiece. It's available in angled (recommended) and straight-through styles. Lets you pair your digital camera adapter to a camera that does not have a threaded lens housing. As with all digiscoping outfits, it's recommended to use a point-and-shoot digital camera with a 3 to 4 power optical zoom. If you get a camera with higher power digital zoom, you'll get vignetting on your pictures. The almost supernaturally sharp, bright Zeiss Diascope with its 20-75x zoom eyepiece provides the highest absolute resolution of any contemporary spotting scope. The following digital cameras will work with the Zeiss outfit. There are probably others that will also work.